APE is a very helpful, straight from the trenches report which covers the gamut of steps, decisions, and actions needed to successfully self-publish a book. There are numerous lessons learned and resources that will enable a rapid application of theory to any publishing venture. The only issue I found is that Guy write from a position of already having a tremendous following and platform vehicles that other people simply do not have. That said, what one learns from his expert deployment of platform vehicles offers insights based on solid track record of pure performance. 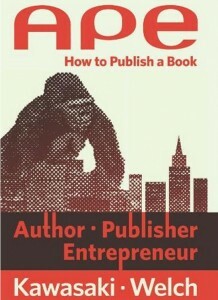 Highly recommended for anyone who even thinks about self-publishing. I give this book five stars!